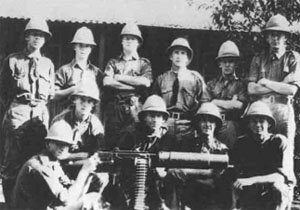 A South African machine gun detachment in East Africa. East Africa: Action of Beho-Beho (until January 4) continues German retreat, but big game hunter Captain Selous DSO killed, aged 65 on January 4. Beves’ South African advance guard crosses river Rufiji in four Berthon boats. Baltic Provinces: Germans take Dvina Island near Glandau northwest of Dvinsk but Russians recover on January 8. Bukovina: Lechitski attack succeeds near Mt Botosul, 2,218 German PoWs taken between Kimpolung and Jakobeny (January 27 and 30); 3 German night attacks fail on January 31. Rumania: Cossack Division leaves Rumanian III Corps for Russian one causing gap that Falkenhayn exploits on January 6. Russia: Imperial family buries Rasputin at Tsarskos Salo by night. His murderers exiled in January 6.